The Premier League Darts rollercoaster is back to kick off February on Sky Sports, here's your guide to the 2019 season. After Michael van Gerwen claimed his third world title at Alexandra Palace on New Year's Day, the darting year got underway with Q-School in Wigan when the final Tour cards for the year was secured. With the fields now set for the year, attention switches to the Pro, European, Challenge and Development Tours and battle to get into the biggest TV events and win the biggest honours. Underpinning it all through the first half of the year is the Premier League - 17 nights of tungsten action, from Newcastle to London's O2 via Dublin, Cardiff, Berlin, Rotterdam, Aberdeen and Birmingham (and much more besides). 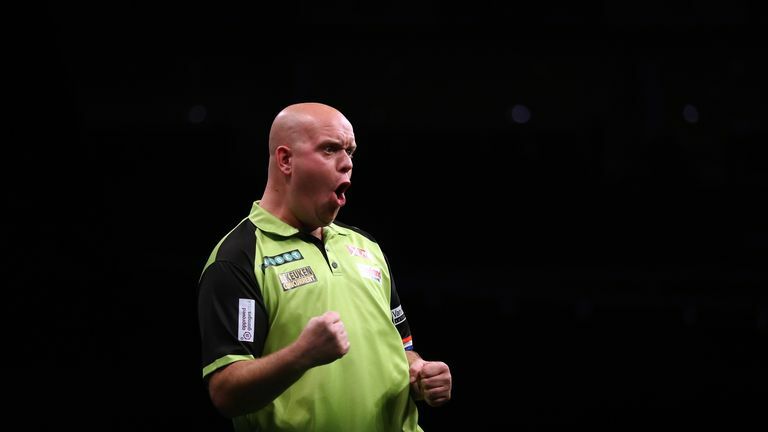 MVG is targeting a fifth title, Raymond van Barneveld begins the final year of his illustrious career while former champion James Wade is back after missing out last year. Sky Sports will join the PDC roadshow every week through until May from the banks of the River Tyne to London's Docklands, and we will have live coverage every night, available on Sky Sports Action & Arena. We start in Newcastle on Thursday, February 4 when the Premier League returns with a repeat of last year's final and the World Championship final - Michael van Gerwen against Michael Smith headlines the action at the Utilita Arena. Sixteen weeks and 17 nights of action - how so? Well we have a double-header in Rotterdam, last year's late addition double in the 'Dam was such a success that we are back for back-to-back nights (March 27 and March 28) and what's more is that March 28 is Judgement Night when two players will be eliminated. Highlight and the best of our video content is showcased on our next generation Sky Q box, which can record and store more than ever before. Series link us to ensure you do not miss a single week or to revisit some of the best of the action and you can even save recordings to your devices to watch when you are out and about. Sky Go: Stay with the live action online, on iPhone, iPad or selected Android smartphones with the Sky Go app and do not miss out on the drama - you can watch Sky Sports without a contract by buying a NowTV pass for a day, week or month. The choice is yours so you can even join us just for the day. We will have all the usual build-up with feature interviews, reaction from our expanding team of experts including Mark Webster, Colin Lloyd, Wayne Mardle, Rod Harrington and Rod Studd. Mardle's predictions are a must read each week and our team will analyse the key talking points, while on the night we live have the usual live blogs full of updates, the best of the action and more. The Darts Show Podcast will keep you up to date with all the action. We will have an episode every fortnight with a rolling cast of guests and interviews, as well as the regular thoughts of Lloydy. Keep your eyes open for The Darts Show Podcast Extra when we will be backstage throughout the tournament for interviews, chat and gossip and loo to give you a flavour of what's going on behind the scenes via bonus podcasts and on our social channels via Periscope and Facebook.